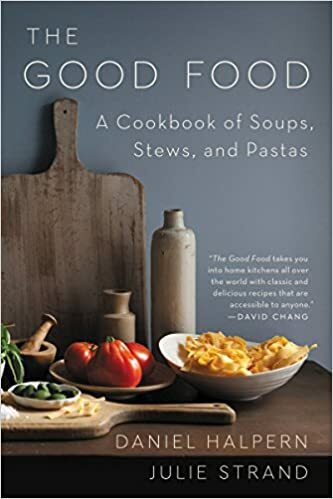 When it was first published in 1985, The Good Food was one of the first cookbooks devoted to the celebration of the best-loved and most satisfying essentials of casual cuisine and, more than thirty years later, it has remained a classic in its genre. Drawing on the diverse cooking traditions of the Americas, Italy, France, India, Morocco, and the Middle East, Daniel Halpern and Julie Strand bring together almost two hundred recipes, including not only the quintessential examples of each cuisine, but also unusual dishes that provide surprising gastronomic rewards. The book features international staples such as Gazpacho and Jambalaya, as well as unexpected delights—Bobotie; Lamb Stew with Eggplant, Saffron, and Ginger; and Penne with Black Olive Puree and Ricotta. The Good Food puts the emphasis where it belongs: on the pleasure of preparing—and eating—excellent and timeless dishes.